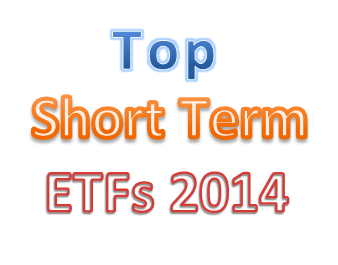 Find best short term bond ETFs 2014 list. These short term bond exchange traded funds provide low risk and income for investors. Exchange Traded Funds or ETFs are popular among active investors. With their low cost and liquidity, you can use ETFs to build your investment core assets. You can invest in bond, stock, or money market. There is variety of ETFs offered by ETF providers such as Vanguard, iShares, SPDR, etc. Short term bond ETFs are investing mainly in high grade corporate and government with short duration (1 to 3.5 years). These debt ETFs typically great for conservative investors or retiree, hence they are less sensitive to interest rates hikes. The funds do provide yield for income. These top performer ETFs are sorted based on its 1 year to date performance in 2014 (up to May 2014). You can find the fund review from this article. Other fund information can be found below such as expense ratio, Morningstar rating, fund’s NAV, managers, fund’s holdings, yield, etc. AdvisorShares Newfleet Multi-Sector Income ETF objective is to provide current income with capital preservation. It invests mainly in investment grade bonds. This top bond fund has a 12 month yield of 2.68%. The current share price is $49.98. Its total net assets are $142 million. The expense ratio fee is 0.75%. In 2014, t has a year to date return of 1.92%. The top 3 sectors in its assets are Non-Agency Residential MBS, Asset-Backed, and Corporate Bond. This new fund is introduced to investors in March 2013. This iSharesBond Mar 2016 Corporate ex-Financials Term ETF provides exposure to investment grade (ex-financial) bonds that mature between April 2015 and March 2016. This ETF has YTD return of 1.11% in 2014. The current yield is 0.61%. Its expense ratio fee is 0.10% per year. With total assets of $29.93 million, this best short term bond ETF has a share price of $100.28. 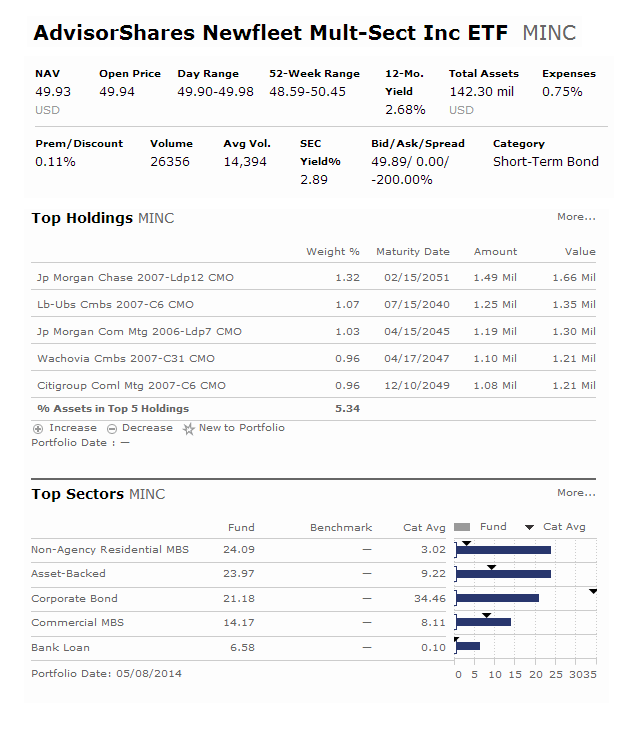 Top 3 bond holdings are Cisco System, Home Depot and Oracle Corp / Ozark Holding. Top sector is corporate bond. 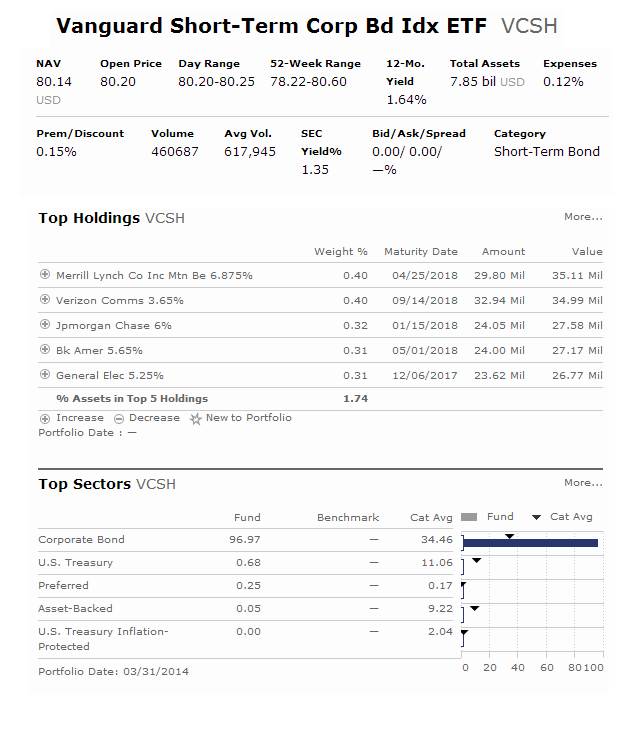 Ranked with 4 stars rating by Morningstar, Vanguard Short-Term Corporate Bond Index ETF is an index bond fund. It has a low expense ratio fee of 0.12%. The total assets are $7.85 billion. The yield is 1.64%. You can buy this ETF from your brokerage as little as 1 share ($80.20/share). This top short term bond ETF has an average effective duration of 2.89 years. The average credit quality is A. This fund has a 3 year annualized return of 3.00%. In 2014, it has a YTD return of 1.13%.